In today’s rapidly evolving regulatory and technology-driven climate, the role of Health Information Management (HIM) has expanded beyond performing traditional Release of Information (ROI) processes. 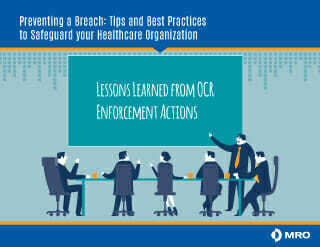 It now also requires the incorporation of specialized services to safeguard Protected Health Information (PHI) across a healthcare enterprise. Termed “PHI disclosure management,” these specialized services assist provider organizations standardize disclosure management policies and procedures, ensure quality, mitigate risk and enhance compliance across a health system. MRO’s suite of solutions include our KLAS-rated #1 Release of Information services, government and commercial payer audit and review management tools, an accounting of disclosures platform, interoperability services and document management technologies. 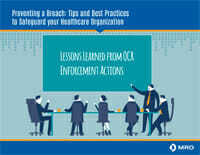 All steps are essential to protect patients’ privacy, respond to requesters, prevent breaches, and ensure proper HIPAA accounting of disclosures and HIPAA privacy rule compliance. To address these changing needs, MRO has developed a suite of solutions that can be used across your entire healthcare enterprise to safeguard the organization by ensuring compliance and quality during the release of medical records and electronic health information. Release of Information—Manage and maintain control over the ROI process, improve HIM departmental workflow and achieve a higher level of compliance oversight with our #1 KLAS-rated solution. Government and Commercial Payer Audit and Review Management—Improve your payer audit and review processes with MRO’s audit defense services and robust audit tracking technologies. Business Office Medical Record Attachments—Improve efficiency, cost savings and compliance with streamlined processes for aggregating and delivering patient records to support claim payments. Accounting of Disclosures—Track, manage and report disclosures inside and outside of the HIM department with our cloud-based platform. Interoperability Services—Get the support you need to move forward on the path of interoperability with MRO’s unique solutions for driving the adoption of interoperable and Health Information Exchange (HIE) technologies. Document Management—Save time, money and office space by automating the capture, filing and storage of paper documents, images and electronic data. Rita Bowen, Vice President for Privacy, Compliance and HIM Policy, describes ROI and Information Governance best practices for PHI disclosure management as organizations partner and merge. Focused on physician practice and medical group challenges, this video shares valuable information for HIM professionals assuming new disclosure workflow policy responsibilities. According to Rita, disclosure workflow in physician practices is rarely discussed. HIM professionals are certain to find new and unique challenges in processing practice records and governing patient information within medical groups.